Commercial banks and other financial institutions are currently putting their records in order so as to ensure that they are not deficient in Anti-Money Laundering and Counter Financing of Terrorism (AML/CFT) rules, as the nation awaits the visit of the Financial Action Task Force (FATF) to Nigeria early next year. FATF is an inter-governmental body established in 1989 by the ministers of its member jurisdictions, of which Nigeria is a member. The objectives of the FATF are to set standards and promote effective implementation of legal, regulatory and operational measures for combating money laundering, terrorist financing and other related threats to the integrity of the international financial system. FATF had in 2013 removed Nigeria from the list of countries identified as jurisdictions with significant deficiencies in AML/CFT regimes. The action was taken then, following the country’s full implementation of the mutually agreed Action Plan and the exhibition of a clear political commitment to continue the development of its AML/CFT regime. As the country awaits fresh visit from the FATF members, the Deputy Governor (Financial System Stability), Central Bank of Nigeria (CBN), Dr. Okwu Joseph Nnanna, stressed the need for banks and other financial institutions to ensure that the country's rating remains positive. Nnanna, also advised banks' board of directors to ensure that their institutions comply with laid down rules. "We do not want to be in the books of FATF. 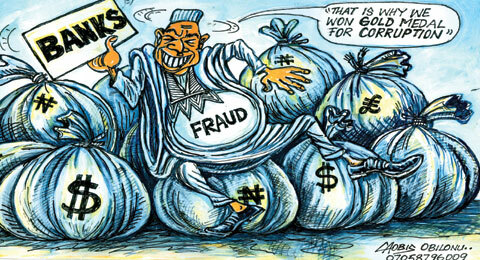 We are expecting them (FATF) to come to Nigeria early next year, to see the level of compliance in our financial system. "We strongly urge you to tell your complaince officers to do their work with all the seriousness it deserves. We shall hold the boards responsible if they come for the surveillance and find any bank wanting, sincerely, it is not just the managing directors of those banks we shall hold responsible, we shall hold the board collectively responsible. "So, talk to your compliance officers. Your reports, checklists and deposits they receive, they should know where they come from. In recent time, when we banned forex deposits in the domiciliary accounts, we knew how much monies were in the vault of banks. I think we should try to avoid that," the CBN deputy governor warned. The global anti-money laundering body had in 2013, welcomed Nigeria’s significant progress in improving its AML/CFT regime and had noted that the country had established the legal and regulatory framework to meet its commitments in its Action Plan regarding the strategic deficiencies that the FATF had identified in February 2010. The FATF had developed a series of recommendations recognised as the international standard for combating of money laundering and the financing of terrorism and proliferation of weapons of mass destruction. They form the basis for a co-ordinated response to these threats to the integrity of the financial system and help ensure a level playing field. First issued in 1990, the FATF recommendations were revised in 1996, 2001, 2003 and most recently in 2012 to ensure that they remain up to date and relevant, and they are intended to be of universal application. In collaboration with other international stakeholders, the FATF works to identify national-level vulnerabilities with the aim of protecting the international financial system from misuse. The FATF's decision making body, the FATF Plenary, meets three times per year.